This entry was posted on March 15, 2013 by admin. 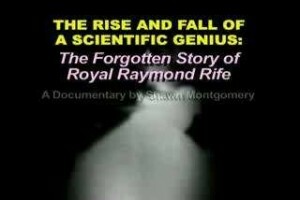 Royal Raymond Rife (May 16, 1888 August 5, 1971) was an American inventor known for his belief that he could observe and render inert a number of viruses which he thought were causal factors in several diseases, most notably cancer. The observations were made though a specially designed optical microscope, only five of which were ever constructed. Rife claimed that a "beam ray" device could devitalize the pathogens by inducing destructive resonances in their constituent chemicals. Rife's claims could not be independently replicated, and active scientific interest in the devices had dissipated by the 1950s. Interest in Rife's claims was revived in some alternative medical spheres by the book The Cancer Cure That Worked (1987), which claimed that Rife's work was successful. The book also claimed that his cure for cancer was suppressed by a conspiracy headed by the American Medical Association. After publication, a variety of devices bearing Rife's name were marketed as cures for diverse diseases such as cancer and AIDS.